The song will spend its second week atop the Billboard Hot 100. Lil Nas X's smash single "Old Town Road" just keeps getting bigger and bigger. 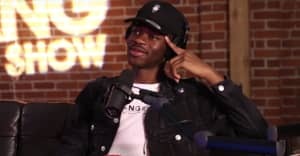 After having quite the news cycle-dominating week, the Atlanta up-and-comer has completely shattered the record for the most streams earned in a single week for a song, as "Old Town Road" spends its second stint atop Billboard's Hot 100 charts. After being projected to break Drake's record, which the OVO artist earned last summer with his Scorpion standout track "In My Feelings," Billboard reports that the song has been streamed over 143 million times over the past seven days — over 20 million times more than Drake's previous record (116 million). The song received an extra push from the recently-released Billy Ray Cyrus remix. Billboard also notes that "Old Town Road" now marks Cyrus' first-ever Hot 100 chart topper. He broke the top ten once in his career with his 1992 jam "Achy Breaky Heart."